درزی نفت چالی, عبد االه, میرلطیفی, سید مجید, شاهنظری, علی, اجلالی, فرید, مهدیان, محمد حسین. (1394). ارزیابی مدل DRAINMOD برای پیش‌بینی عمق سطح ایستابی و دبی زهکش در اراضی شالیزاری مجهز به زهکشی زیرزمینی. نشریه آبیاری و زهکشی ایران, 9(4), 583-593. عبد االه درزی نفت چالی; سید مجید میرلطیفی; علی شاهنظری; فرید اجلالی; محمد حسین مهدیان. "ارزیابی مدل DRAINMOD برای پیش‌بینی عمق سطح ایستابی و دبی زهکش در اراضی شالیزاری مجهز به زهکشی زیرزمینی". نشریه آبیاری و زهکشی ایران, 9, 4, 1394, 583-593. درزی نفت چالی, عبد االه, میرلطیفی, سید مجید, شاهنظری, علی, اجلالی, فرید, مهدیان, محمد حسین. (1394). 'ارزیابی مدل DRAINMOD برای پیش‌بینی عمق سطح ایستابی و دبی زهکش در اراضی شالیزاری مجهز به زهکشی زیرزمینی', نشریه آبیاری و زهکشی ایران, 9(4), pp. 583-593. درزی نفت چالی, عبد االه, میرلطیفی, سید مجید, شاهنظری, علی, اجلالی, فرید, مهدیان, محمد حسین. ارزیابی مدل DRAINMOD برای پیش‌بینی عمق سطح ایستابی و دبی زهکش در اراضی شالیزاری مجهز به زهکشی زیرزمینی. نشریه آبیاری و زهکشی ایران, 1394; 9(4): 583-593. در این تحقیق، کارایی مدل DRAINMOD برای شبیه­سازی نوسانات سطح ایستابی و تغییرات دبی زهکش­های زیرزمینی در اراضی شالیزاری دانشگاه علوم کشاورزی و منابع طبیعی ساری ارزیابی شد. در طول مدت برقراری وضعیت زهکشی آزاد از یک فصل کشت کلزا (هفت آذر 1390 تا 14 فروردین 1391)، مقادیر عمق سطح ایستابی و دبی زهکش­ها برای سه سیستم زهکشی زیرزمینی شامل سیستم زهکشی با عمق 9/0 متر با فاصله زهکش 30 متر (D0.9L30)، عمق 65/0 متر با فاصله زهکش 30 متر (D0.65L30)و عمق 65/0 با فاصله زهکش 15 متر (D0.65L15) اندازه­گیری شد. عملکرد مدل در فرایند واسنجی و اعتبارسنجی با استفاده از آماره­های راندمان مدل (EF)، درصد خطا (PE)، ضریب تعیین (R2)، جذر میانگین مربعات خطا (RMSE) و میانگین انحراف (AD) ارزیابی شد. 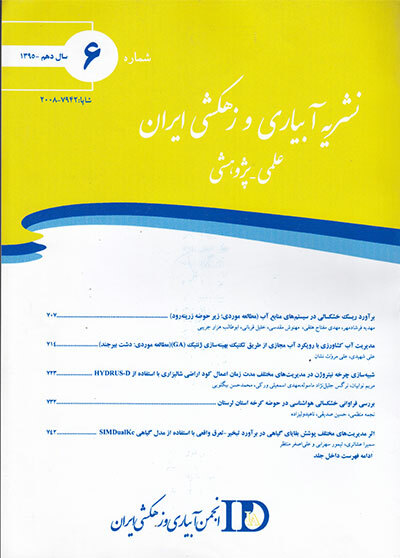 متوسط مقادیر عمق سطح ایستابی شبیه­سازی شده در تیمار واسنجی (D0.65L15)، برابر متوسط مقادیر اندازه­گیری شده آن (4/32 سانتی­متر) در این تیمار در دوره مطالعه بود. در مرحله اعتبارسنجی، مقادیر عمق سطح ایستابی اندازه­گیری و شبیه­سازی شده در تیمار D0.65L30 به­ترتیب 1/24 و 1/14 سانتی­متر و در تیمار D0.9L30 به­ترتیب 1/2 و 7/19 سانتی­متر بود. مقادیر EF، PE، R2، SE و AD برای دبی­های پیش­بینی شده به­ترتیب از 1/5- تا 3/1-، 1/9 تا 6/21، 2/0 تا 35/0، 08/0 تا 11/0 و 07/0 تا 1/0 متغیر بود. مقایسه مقادیر اندازه­گیری شده با نتایج شبیه­سازی­ها نشان داد که می­توان از مدل DRAINMOD به­عنوان یک راهنمای کلی برای پیش­بینی روند تغییرات عمق سطح ایستابی و دبی زهکش­ها در منطقه مطالعه استفاده کرد. In this research, the applicability of DRAINMOD model for simulating water table fluctuations and subsurface drain discharge variations was evaluated at the consolidated paddy fields of Sari Agricultural Sciences and Natural Resources University. During free drainage period of a canola season (November 28, 2011- April 2, 2012), water table depths and subsurface drain discharges were measured in three subsurface drainage systems including drainage system with drain depth of 0.9 m and drain spacing of 30 m (D0.9L30), drain depth of 0.65 m and drain spacing of 30 m (D0.65L30), and drain depth of 0.65 m and drain spacing of 15 m (D0.65L15). The reliability of the model was tested using the statistics including model efficiency (EF), percent error (PE), coefficient of determination (R2), root mean square error (RMSE) and mean deviation (AD). Mean values ​​of measured and simulated water table depths in the calibration treatment (D0.65L15) were both 32.4 cm. For validation treatments, such values were, respectively, 24.1 and 14.1 cm for D0.65L15 and 2.1 and 19.7 cm for D0.9L30. EF, PE, R2, RMSE and AD values for predicted drainage discharges ranged from -5.1 to -1.3, 9.1 to 21.6, 0.2 to 0.35, 0.08 to 0.11 and 0.07 to 0.1, respectively. Comparison of measured values ​​with the simulation results showed that DRAINMOD model can be used as a practical tool for predicting the general pattern of water table and drain discharge variations in the study area. بای بوردی،م. 1378. اصول مهندسی زهکشی و بهسازی خاک. چاپ هشتم، انتشارات دانشگاه تهران، 641 صفحه. حسن­پور،ب.، پارسی­نژاد،م. سلحشور دلیوند،ف و کوثری،ه. 1389. برآورد نوسانات سطح ایستابی در اراضی شالیزاری با استفاده از مدل DRAINMOD (مطالعه موردی: رشت). نشریه آبیاری و زهکشی ایران، 2 .4: 174-167. درزی،ع.، میرلطیفی،س.م.، شاهنظری،ع.، اجلالی،ف و مهدیان،م.ح.، 1391. تاثیر زهکشی سطحی و زیرزمینی بر تلفات فسفر از اراضی شالیزاری. نشریه آبیاری و زهکشی ایران، 3 .6: 225-215. درزی،ع.، میرلطیفی،س.م.، شاهنظری،ع.، اجلالی،ف و مهدیان،م.ح.، 1392. تاثیر زهکشی سطحی و زیرزمینی بر تلفات نیتروژن از اراضی شالیزاری. نشریه آبیاری و زهکشی ایران، 3 .7: 305-294. زارع ابیانه،ح.، نوری،ح. لیاقت،ع. کریمی،.ا و نوری،ح. 1390. واسنجی آبشویی نیترات و نوسانات سطح ایستابی در زمین­های شالیزاری با استفاده از نرم­افزار DRAINMOD-N. مجله علوم و فنون کشاورزی و منابع طبیعی، علوم آب و خاک.57: 60-49. علی­بخشی،ح.،. شاهنظری،ع و طهماسبی،ر. 1392. شبیه­سازی انتقال نیترات اراضی شالیزاری مازندران در فصل کشت کلزا برای مدیریت منابع آب. مدیریت آب و آبیاری، 3 .2: 42-29. علیزاده،ا.، 1382. زهکشی اراضی، طرح و برنامه ریزی سیستم های زهکشی در کشاورزی. چاپ پنجم، انتشارات آستان قدس رضوی، 448 صفحه. علیزاده،ا.، 1380. رابطه آب و خاک و گیاه، چاپ دوم، انتشارات آستان قدس رضوی، 353 صفحه. Ale,S., Bowling,L.C., Brouder,S.M., Frankenberger,J.R and Youssef,M.A. 2009. Simulated effect of drainage water management operational strategy on hydrology and crop yield for Drummer soil in the Midwestern United States. Agricultural Water Management 96: 653 – 665. Borin,M., Morari,F., Bonaiti,G., Paasch,M and Skaggs,R.W. 2000. Analysis of DRAINMOD Performances with different detail of soil input data in the Veneto region of Italy. Agricultural Water Management 42: 259-272. Darzi,A., Ejlali,F., Ahmadi,M.Z and Najafi,G. 2007. The suitability of controlled drainage and subirrigation in paddy fields. Pakistan Journal of Biological Sciences, 10: 492-497. Desmond,E.D. 2003. Studies including hydrologic modeling and data analysis at the Ohio management systems evaluation area dissertation Presented in partial fulfillment of the requirements for the Degree Doctor of Philosophy in the Graduate School of The Ohio State University, p. 104. El-Sadek,A., Feyen,J and Berlamont,J. 2001. Comparison of models for computing drainage discharge. Jour. of Irrigation and Drainage Engineering, Nov- Dec: 363-369. He,X., Vepraskas,M.J., Skaggs R.W and Lindbo,D.L. 2002. Adapting a drainage model to simulate water table levels in coastal plain soils. Soil Sience Society of America Journal 66: 1722-1731. Khalil,B.M., Abdel-Gawad.,S,T and Millette,J.A. 2004. Impact of controlled drainage on rice production, irrigation water requirement and soil salinity in Egypt. ASAE conference Proceeding, Drainage VIII,21-24 March, Published by the American Society of Agricultural and Biological Engineers, St. Joseph, Michigan www.asabe.org. Legates,D.R and McCabe,G.J. 1999. Evaluating the use of “goodness-of-fit” measures in hydrologic and hydroclimatic model validation. Water Resources Research, 35, 233-241. Madramootoo,C.A., Broughton,S.R and Dodds,G.T. 1995. Water table management strategies for soybean production on a sandy loam soil. Canadian Agricultural Engineering, 37.1: 1-8. Mostaghimi,S and McMahan,P.C. 1989. Surface and Subsurface Drainage Simulations for a Claypan Soil. Published by Elsevier Science B.V., Agricultural Water Management 15.3:211-222. Mostaghimi,S., Lembke,W.D and Boast,C.W. 1985. Controlled-Drainage/ Subirrigation Simulation for a Claypan Soil. TRANSACTIONS of the ASAE 28.5:1557-1563. Nash,J.E and Sutcliffe,J.V. 1970. River flow forecasting through conceptual models, A discussion of principles. Journal of Hydrology, 10: 282-290. Poole,C.A. 2006. The effect of shallow subsurface drains on nitrate-n and orthophosphorus losses from drained agricultural lands. A thesis submitted to the Graduate Faculty of North Carolina State University in partial fulfillment of the requirements for the Degree of Master of Science, Pp, 238. Shukla,M.B., Prasher,S.O. Madani,A and Gupta,G.P. 1994. Field validation of DRAINMOD in Atlantic Canada. Canadian Agricultural Engineering 36.4:205-213. Sinai,G and Jain,P.K. 2006. Evaluation of DRAINMOD for predicting water table heights in irrigated ﬁelds at the Jordan Valley. Agricultural Water Management, 79.2: 137–159. Singh,R., Helmers,M.J and Qi,Z. 2006. Calibration and validation of DRAINMOD to design subsurface drainage systems for Iowa’s tile landscapes. Agricultural Water Management, 85: 221 – 232. Skaggs,R.W. 1980. Drainmod Reference Report; Methods for design and evaluation of drainage water management systems for soils with high water tables, USDA, SCS, North Carolina State University, Raliegh,p. 185. Skaggs,R.W., Youssef,M.A and Chescheir,G.M. 2012. DRAINMOD: model use, calibration and validation. Transactions of the ASABE. 55 .2: 1509-1522. Wang,X, Mosley,C.T. Frankenberger,J.R and Kladivko,E.J. 2006. Subsurface drain flow and crop yield predictions for different drain spacings using DRAINMOD. Agricultural Water Management. 79: 113–136. Yang,X., 2008. Evaluation and application of DRAINMOD in an Australian sugarcane field. Agricultural Water Management. 95: 439 – 446. Youssef,M.A., Skaggs,R.W., Chescheir G.M and Gilliam,J.W. 2003. Field Evaluation of DRAINMOD 5.1 Using Six Years of Data from an Artificially Drained Agricultural Field in North Carolina. Paper number 032367, ASAE Annual Meeting, Published by the American Society of Agricultural and Biological Engineers, St. Joseph, Michigan www.asabe.org.